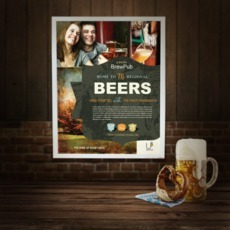 Refurbish your marketing strategy with UPrinting’s semi-gloss large format posters. These prints combine the qualities of high gloss and matte. Semi-gloss posters have high resolution and lively colors. They produce fewer glares than high gloss posters. These distinctions allow semi-gloss posters to be flexible. They are durable (great for promotional purposes) and have just enough shine to make them appropriate for business presentations and campaigns. If you don’t want your posters to be neither too polished nor too plain, then this is perfect for you. Here at UPrinting, we print custom large format posters with either a high- or semi-gloss finish. Our semi-gloss posters have a soft sheen and are non-reflective. They are available both at popular or custom sizes. No minimum order required. Have your orders processed in less than 3 business days! For more information about semi-gloss large format posters, just call us at 1-888-888-4211 or click on our live chat assistance button.